At five days old, Kei has given his grandmothers the pissed-off finger. Bad bad! 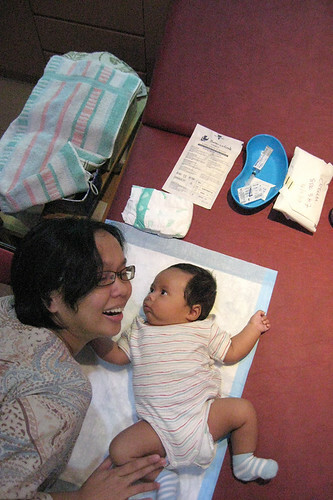 At one month Kei began to have a meaningful eye contact and follow objects through his eye movements. But i haven't got his voluntary smile yet. Also at one month he was able to lift his neck when he's put belly down. I got his first smile at around five-six week. At around seven weeks Kei was circumcised (i'm sure we're gonna face a lot of lambasting from other agnostics / atheists, but we decided to do this anyway..). After his wound healed, at around eight-nine week, we began with cloth diapering. This is the right age because his bowel movement had become more regular and his pee was getting less frequent. I got fresh new stash from bumwear and bumgenius websites. 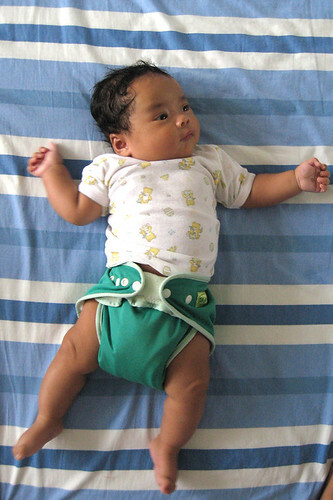 Kei has been loving his cloth diapers and he looked really cute in them. 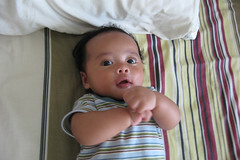 At three months, end January, Kei was able to clasp both his hand together at the centre of his body. He also began to be able to grasp things. A few days later, he was able to lean himself sideways 45 degree. Striving to defy gravity. We began to be more carefree with Kei's neck, which has become stronger. At three and a half months, Kei began to grab things that are lying around him. 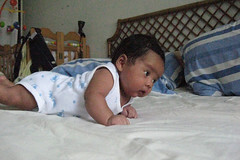 At four months, Kei began to play with his saliva, making BRRR sounds. Indonesians believe that this is the time when mother begins to shed hair. True enough, a few days later, I began to shed my hair. This will last for many months, NOT liking it at all. At four and a half months, early March, Kei began to roll more steeply, but not quite rolling over yet. One week later, Kei totally rolls over, and he really loved rolling over and back. He also began to be able to pull himself to sitting position, and surprisingly, to STANDING position, when I hold his hands. It's not that we pull him into sitting / standing position, Kei insisted that he pull himself to that positions, albeit wobbly. And just like his brother, Kei also flew in an airplane for the first time at four months from Singapore to Jakarta and back. Timely enough to be shown to relatives in Jakarta. Initially, I was supposed to fly to Jakarta with Kei and Noe on tow. I'm not a super mom, unlike Jeng Hany who's able to take care two toddlers at the same time, so I begged to Indi to split the baby caring job, because I didn't know how Kei would react on the airplane. Finally Indi babysat Noe while Kei and me went to Jakarta for family event. Luckily Kei behaved really well in the airplane, no crying no fussiness, despite a very uncomfortable Lion Air (but cheap) flight. I became more confident that next time I should be able to get two kids on tow by myself. Amen. Overall Kei shared similar milestones as his brother. One thing different, Kei has fell sick with common cold TWICE, while Noe only fell sick after he was one year old. Well, with two kids, germs coming from the older brother's school got into Kei's immune system. And consequently, mummy also fell sick more often when one kids fell sick and hence began a circle of disease jumping from one person to another. When one kid fell sick, the disease could stay in the house for more than week thereafter, because other member of the family would get the disease. Luckily with breastfeeding the kids get well quickly. Hopefully Kei would be stronger and more resilient when he begins playgroup in a few years. Kei lebih ndut dari Noe ya mbak?? Tp ktnya jd spt anak kembar? WHIH, tambah ndut aje si Kei! Perasaan kmaren masih ngantuk2 merem melek di Punggol. When are you guys moving to Jkt exactly? Ntar si Yodhi mo tinggal sendirian di rumah tuh? Ada temen lagi nyari rumah nih buat mulai June, baru balik dari training Rolls-Royce di Aberdeen. Membuka vacancy ga tuh? I came across your blog while looking for cloth diapering resources in Jakarta - do you know of any? I see you are using bumgenius and bumwear diapers, if you would like to try a starbunz or rumparooz diaper (the latter of which is fantastic for runny breast feed poos) get in touch!